Chris Katulka: Welcome to the Friends of Israel Today. I'm your host, Chris Katulka, and with me is our executive producer and co-host, Steve Conover. Over the next two weeks, we're going to be focusing on righteous gentiles, gentiles who helped save Jewish people from the Holocaust. Steve, recently, you had a chance to speak to Cheryl Buxamusa, who portrays Corrie ten Boom, a Dutch watch-maker and Christian who, along with her family, helped many Jewish people escape the Nazi Holocaust. Steve Conover: Yeah, Chris, a while back, Cheryl came to the Friends of Israel to speak to our headquarter staff. I had the chance to sit down with her. What's interesting about her story is, she knew Corrie ten Boom personally. So, stick around to hear my conversation with Cheryl Buxamusa. Chris Katulka: Also, later on the program, I'm going to share with you a story of Halina, one of our Friends of Israel workers who is currently ministering in Poland. Halina has an amazing testimony of how she stood up against the evils of the Nazi regime. But first, the news. The Trump administration reimposed strict sanctions on Iran following President Obama's failed Iran deal. Israeli prime minister Benjamin Netanyahu responded to President Trump's actions by saying, "This symbolizes the determination to curb Iran's regional aggression and its ongoing plans to arm itself with nuclear weapons." Well, here's my take. President Trump's sanctions could have a profound effect on forcing Iran to change since Iran's economy is already crumbling. Also, Iranian citizens themselves want change. They know that the regime that governs them is corrupt. Recent economic protesters in Iran shouted, "Death to Palestine" instead of their usual mantra, "Death to Israel" because they know that their money is going to fund terrorism and not their own people, the Iranian people. Trump's new sanctions could be the beginning of the downfall of the Iranian regime. Steve Conover: Recently, Cheryl Buxamusa gave a presentation to our staff on Corrie ten Boom. Cheryl's portrayal of the Dutch Holocaust survivor has been performed throughout the United States, Canada, and the Netherlands. It's my joy to have a few minutes now to talk with her about the influence Corrie ten Boom had on her life. Cheryl, welcome to the program. Cheryl Buxamusa: Thank you very much. Steve Conover: Cheryl, the Friends of Israel had a personal connection to Corrie through our first executive director, Victor Buksbazen, and you had a personal connection to her, as well. Tell us about your time with her. How did you two come to meet? Cheryl Buxamusa: Well, I was living in the Netherlands. Actually, I moved there in 1968. I went there for the first time with Youth For Christ. I was on a Youth For Christ teen team and I ended up staying there and working with Youth For Christ in the coffeehouses, coffee bars, we called them. I read the book about Brother Andrew, actually. Steve Conover: I know that book. Cheryl Buxamusa: I said to my husband at the time, "How about we make a trip?" Because it was all young couples going on these trips behind the Iron Curtain, as we called it in those days. We drove out there and began to make trips. Little did I know that Corrie ten Boom also made these trips. One weekend, they had a retreat and her friend, her not just friend, but it was her nurse/companion, Ellen de Kroon, and I began to tell her about a problem that I had. I had been a passenger in four car accidents within one month. Cheryl Buxamusa: It was really troubling me because I was so fearful to ride in a car anymore. I began to talk to Ellen about it and she said, "Why don't you come home and talk with Tanta Corrie about it?" I stayed over and met her and I just had the time of my life. I poured out my problem to her. She really helped me a lot and began to share. I didn't really know her that well. I mean, I knew of her. I had heard her speak. But this was very personal. She really ministered to me as a young missionary, I guess you would call me. I was working in Christian coffee bars and doing work with Brother Andrew. It was a terrible thing. I had to travel all the time, but I didn't dare to travel anymore. Corrie helped me a lot with that. One of the neat stories that she told me, which I also told in my portrayal today, was that she was afraid of death. As a little girl, she talked to her papa and she said to him, "Papa, you know what? I'm afraid to die." Her father was so wise and he gave his life for the Jewish people. But he was a wise man and he said to Corrie, "You know, Corrie, when Papa takes you on the train, when do I buy the ticket for you? Do I buy it to you two weeks in advance?" She said, "Oh, nee, Papa, because then I would lose my ticket for sure." She said, "So it is with the Lord, Corrie. He will give you the ticket on the day of the journey." If you're afraid of dying in a car accident or you're afraid of losing someone that you love, all of that fear ahead of time that you're contemplating something bad happening is really a waste of time. She said, "But, you know, at that moment when you need the strength, if you have to go through that, God will give you the strength. He'll give you the ticket for the journey." It was little things like that, her little stories. Now when I portray her, I throw in those very same stories in my ministry that I'm doing. Steve Conover: Cheryl, Corrie's story has been told in movies, books, audio dramas. Why do you think her story is still relevant for us today, these many years later? Cheryl Buxamusa: That's a really good question. You know, I believe so strongly that it is very relevant. I just read this past week that there was a survey done amongst teenagers, young people, millennials, if you want to call them that, and only a third had ever heard of the Holocaust. They could not tell you what it was. I really want to keep the story of the Holocaust alive. There are so many who don't believe that it happened. Even though it didn't happen to me, I lived so many years in Holland and I had so many friends who were Corrie ten Booms who were just like Corrie, who hid people in their house, who suffered. My own father-in-law hid in a closet during the war because they were capturing all young men and taking them, shipping them off to slave labor camps in Germany. He had a family. He would hide in his closet during the day and he would come out at night. His family could come and see him once in a while. I want to keep the story alive, not only the story of the Holocaust, but Corrie's story because I feel, you know, she's a real woman of God who lived in my lifetime and your lifetime. I want to tell my kids, "Wow, she was really something and we can be like her if we just believe we can." That's what I want to do. Steve Conover: Yeah, you mention keeping her story, her memory, alive. I'd like to hear more about that. How are you doing that? Cheryl Buxamusa: Well, in my play, I quote Corrie when she said, "We began to save as many Jewish people as we could. We had not planned it, but God had planned it." I feel with my story, what I do portraying her, I had not planned it, but God had planned it, really. My daughter had gone to Central College in Pella, Iowa, and after she graduated she began working for the college in their PR department. She called me one day, I would say, in January or so of 2002. She asked me, "We're going to have a Holocaust remembrance week and we're getting in an actor to portray Oskar Schindler," who also has a tree on the Avenue of the Righteous, which Corrie ten Boom also has, honored by Yad Vashem and so forth. She said, "Mom, I know you can play a Dutch accent." Actually, I studied drama. I've been a theater and a music teacher for many years and I've done a lot of acting. I've been in a lot of musicals and stuff. She knows I can act and she knows I can do a good Dutch accent. She knows I knew Corrie. She says, "Mom, I just think you'd be the perfect one. Well, would you just do it for the students? I will make sure you get a meeting in the evening with the parents and you can do it again." I did it in the daytime and I practiced it. I got a tape. Actually, Corrie appeared on Focus on the Family. In those days, those were cassette tapes. I typed it out, memorized it, and then it grew. I just went to Central College for that one night. Little did I know, the fire was going to hit the pan. People started coming up to me afterwards and they'd go, "Oh, man, would you come to our church? Do you have a card?" No, I don't have a card. I would scribble my telephone number on a little piece of paper. Someone asked me that was there that night if I'd go to Minneapolis. In Minneapolis, there was someone from Sioux Falls, South Dakota, and then they called me up. Then it just went to someone else in Beresford, South Dakota, and Iowa, and then it began to go to other states, Minnesota, Michigan. I've been in Ohio and, of course, in Canada, and even all over the United States, really. It's just gone by word of mouth. Steve Conover: How have Jewish audiences responded to your presentation? Cheryl Buxamusa: That's a rather very interesting question. It is my desire to do this for a Jewish audience. I have really tried and I have a pastor friend who lives in Toledo and he said, "We are going to invite the Greater Toledo Jewish," I don't know what you call it exactly. It's a conglomeration of synagogues. "They're going to come hear you. Do you care?" I said, "No, care? I would love that!" They did come and they were very receptive. Very. It was very interesting at that particular meeting. One person that really sticks out in my mind was a German lady who lived very close to Ravensbrück during the war. She was just a little girl. She was just sobbing because she said, "It was so close to us and we did nothing." There always seems like, you know- And I love it with the Jewish people. I love it because I love them just as Corrie did. Steve Conover: If one of our listeners is interested in having you come speak, I know you mentioned word of mouth, but if they want to get in touch with you, how could they find you now? Cheryl Buxamusa: Well, two ways. I'm actually on Facebook now, Dramatic Portrayal of Corrie ten Boom, if they type that in if they happen to be on Facebook. There I also publish anything I find about survivors from the concentration camps, people that are still alive who are telling their story today, just because I figure every time I do that, I sort of put a nail in the wall of, "There's another one, there's another one, there's another one." This story isn't made up. It's not made up by the Jews or by anybody else. That's one way. The other way is they could email me, which is c, stands for Cheryl, buxamusa, B-U-X-A-M-U-S-A, @att.net. Steve Conover: If you missed that information, that'll be in our show notes for this weekend's program and you can find that at FOIRadio.org. Cheryl, thank you for spending time with us today. Chris Katulka: In 1939, the Nazis took control of Poland. A young Polish woman named Halina was faced with the decision to fall in line with the Nazi agenda or stand against evil. In the book "Halina: Faith in the Fire," Dr. Elwood McQuaid writes of Halina Ostik's commitment to believing in the triumph of her cause regardless of personal cost. The essence of this book tells the story of an amazing individual who walks through the fires of Hitler's genocidal rampage and survives. In this book, those who resist evil had names that are really obscure to most of us here in the west, yet their courage is contagious and it leaves a legacy of hope for us today. Steve Conover: You can order your copy of "Halina: Faith in the Fire" by visiting FOIRadio.org. That's FOIRadio.org or call our listener line at 888-343-6940. Once again, that's 888-343-6940. Chris Katulka: Poland was a beautiful place that had stunning landscapes, scenic rivers, and quaint villages. But in 1939, Hitler had declared war on this idyllic country. When the news arrived in Warsaw of the coming storm that would be coming from Germany, squads of Polish workers started digging trenches in strategic locations hoping to protect the city from the massive Nazi onslaught. The Nazis considered the Polish people racially inferior and so, in their eyes, they were totally unfit to participate in Germany's thousand-year Third Reich. Hitler's plan was essentially to subjugate the Polish people to a brand of brutality unlike anything they've ever experienced. Hitler's plan also included the Final Solution, to eradicate the world of the Jewish people. Halina was a Polish young woman who grew up in a home that had a Bible on every nightstand and her parents revered its words, which shared of God's love for Israel and the Jewish people. Halina and her brother were taught to love the Jewish people, even though anti-Semitism, which is the hatred of the Jewish people, was rampant in Poland at that time. Halina and her mother escaped Warsaw as the Germans were advancing into Poland. Now, worried about the children and her family who were scared of war, Halina built bomb shelters with the skills she had learned from the Polish Girl Guides, which is really similar to our Girl Scouts. Polish Girl Guides helped girls develop their character and talents, think critically, and work well with others so that they would eventually become mature and patriotic Polish citizens. When the Germans arrived in Poland, they outlawed guiding and scouts, but that didn't stop Halina from taking her guide skills to aid the Polish resistance army. In fact, the Polish Girl Guides became a key factor in fighting the Nazis. Their first aid skills were used in medical stations. They were trained to listen for enemy bombers and to identify the different types of aircraft the Germans were using. They cared also for orphans and refugees and they even smuggled in food and rescued Jewish children, taking them to homes that were provided by the resistance. You know that some say, "Were it not for the Girl Guides, it's doubtful the Polish resistance would have ever been successful as it was in obstructing the German forces and their aggression in Poland." Halina joined the Polish resistance against the Nazis by partnering with a group of girls who would be responsible to find and train volunteers to teach them basic nursing skills. This was an extremely dangerous task, since anyone participating in resistance would be considered breaking a capital offense that would result in immediate execution if they were captured by the Nazis. Halina was putting her life on the line. She knew it was either surrender to the Nazis and be forced into slave labor, or die fighting against the evil that had overtaken her homeland and the Jewish people. Halina chose to resist the Nazis. By 1945, Halina had endured nearly six years of war and the death of her brother, transforming her from a bright 20-year-old who relished in every new experience possible into a battle-hardened young woman on the verge of mental and physical exhaustion. But it was her faith in Jesus Christ that carried her through the difficult times during the war, and it was this faith in the fire that would only make her more determined, more resolute, to share the love of God to those in need of Christ and to teach about God's love for Israel and the Jewish people in communist Poland following the war. Halina would eventually come to serve with the Friends of Israel Gospel Ministry in Poland and one of our current representatives in Poland, whose life was greatly impacted by Halina's ministry, said this about her. "Halina spoke on topics of spiritual awakening, life, and the evangelistic mission in the world. Above all, she passionately spoke out about God's love to the Jewish nation. This discovery has changed the course of my life." Halina is now 99 years young and remains a blessing to the Polish people she has ministered to over the years, and that's why I want to encourage you to get the book "Halina: Faith in the Fire." It's all about this courageous young woman, a Deborah in modern times, who stood up against evil, stood up against the Nazi regime, fought back against the persecution against the Jewish people, and on the other side of it all, shared her faith and made God's love of Israel and the Jewish people known. 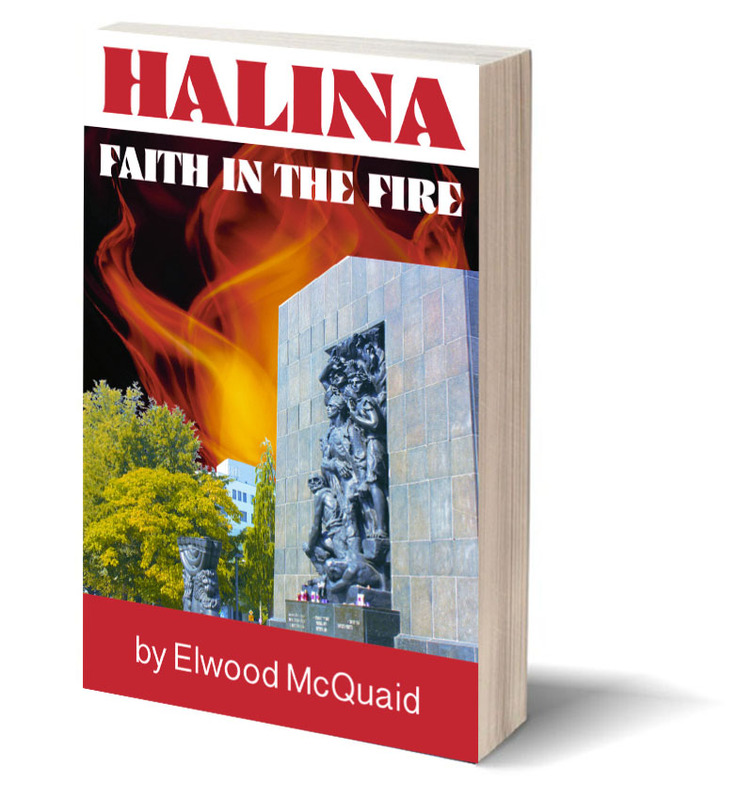 Be sure to get your copy of "Halina: Faith in the Fire." Steve Conover: Now, Apples of Gold, a dramatic reading from the life and ministry of Holocaust survivor, Zvi Kalisher. Mike Kellogg: Many schoolchildren in Israel have never heard of the Holocaust, so when Holocaust Memorial Day draws near, schools look for survivors to come tell what they experienced during World War II. Schools invite me to speak. Ordinarily, I cannot go to a school and speak of faith in Christ, but when they call me, I am free to speak about Him in whom I have believed. This is a wonderful opportunity to tell the children something they have never heard, the truth about our Savior, Jesus Christ. Recently when I was speaking at a school, the students asked how I came to believe as I do. "After all," one said, "we are Jewish." Yes, we are the chosen people of God. I explained it is our obligation before God to tell people the truth. "But you speak about another faith," a student said. So I ask, to whom was the Holy Bible given? "To the people of Israel," they all declared. "Yes," I said, "and as His chosen people, do we have the right to choose which parts of the Bible are good to read and which are not? Do the rabbis have a right to say which chapters of the Bible are kosher and which are not?" "This is strange. We have never heard anyone speak as you do." Then they all wanted to know which chapter of the Bible the rabbis claim should not be read. I replied, "Have you read Isaiah 53? Have your teachers ever spoken to you about this chapter?" The students all agreed they had not read Isaiah 53. I told them, "I will read it for you or you might read it and I will listen. After, we will have time for questions to see if we can determine why the rabbis do not teach you the truth about what is written here." The students took turns reading. Afterward, one asked, "Why is this such a secret?" "The Bible," I said, "was written by the Holy Spirit of God. No one has the right to erase anything from this Holy Book, not even a single letter. Do you see what they have done? They do not want the chosen people of God to know the truth and to know what great things God has done for us. But as you know, it is hard to fight against the truth, especially against what was written by the Holy Spirit of God." The students then started asking me questions such as, "Are you one of us? Are you an Israeli?" "Oh, I am surely an Israeli and I believe all that is written in the Bible. If that is not enough for you, I have fought in every war beginning with the War of Independence in 1948 through the Yom Kippur War in 1973. The ultra-orthodox do not serve in the Israeli army." The students continued to ask good questions and slowly we came to the subject of how to place your faith in the Lord. At the end of the class, they said this was the most interesting lesson they ever had and one they will never forget. Steve Conover: We hope you've enjoyed today's program. I want to thank Cheryl Buxamusa again for joining us. Also, I want to remind you to purchase your copy of "Halina: Faith in the Fire." Go to FOIRadio.org or call our listener line at 888-343-6940. We'll give you that information again. Finally, be sure to join us next week. We're going to continue our discussion on righteous gentiles where we'll hear from Susan Kokkonen, director of Christian Friends of Yad Vashem, which is the Holocaust memorial in Israel. The Friends of Israel Gospel Ministry has been sharing the love of the Messiah and supporting Israel and the Jewish people since 1938. If you feel led to support our work or you simply want to reach out to us, visit FOIRadio.org. That's FOIRadio.org, or you can call our listener line at 888-343-6940. Again, that's 888-343-6940. Our host and teacher is Chris Katulka. Today's program was produced by Tom Gallione, co-written by Sarah Fern. Mike Kellogg read Apples of Gold. Our theme music was composed and performed by Jeremy Strong. I'm Steve Conover, executive producer. The Friends of Israel Today is a production of the Friends of Israel Gospel Ministry. We are a worldwide Christian ministry communicating Biblical truth about Israel and the Messiah while fostering solidarity with the Jewish people. “Worry does not empty tomorrow of its sorrow. It empties today of its strength.” Do you recognize this quote? It was said by Corrie ten Boom, Holocaust survivor and Righteous Gentile. Corrie ten Boom is quoted a lot around Christian circles. Many believers have read her works and heard of her and her family’s courageous story of hiding Jewish people in her home and later being sent to Nazi concentration camps. For the next two weeks we are remembering the Righteous Gentiles, those who helped save Jewish people during the Holocaust. This week we welcome our guest Cheryl Buxamusa. Cheryl was a friend of Corrie ten Boom and now travels the world portraying Corrie in front of audiences. It is sacrificial people like Cheryl who are helping keep the story of the Holocaust up front in people’s lives. We need more people like Cheryl telling these stories because we know that nothing is new under the sun and that history can sadly repeat itself. In 1939, the Nazis took control of Poland. A young Polish woman named Halina was faced with the decision to fall in line with the Nazi agenda or to stand against evil. Halina Ostik’s commitment to believe in her cause regardless of personal cost is the essence of this book. It tells the story of an amazing individual who walked through the fires of Hitler’s genocidal rampage and survived. In our second segment, Chris tells the story of a lesser known Righteous Gentile, Halina Ostik. Halina is a Friends of Israel Gospel Ministry worker in Poland and was part of the Polish resistance during World War II. As you listen to her story of courage, our prayer is that you will see how God can use your experiences and talents in the most unusual ways. And if we are available, we can be used in big and small ways for Him. If you would like to support Halina, please visit her online donation page. Every year around Holocaust Remembrance Day, schools would ask Zvi to come and speak to their children about the Holocaust. Zvi was always willing to take these opportunities because normally he could not speak in schools. As he would tell his story, he would explain his faith in the Messiah. Listen as the children ask him questions—important questions—that could change their lives for eternity. Zvi’s story is available in Elwood McQuaid’s book, “Zvi: The Miraculous Story of Triumph over the Holocaust,” available at our online store. More stories from Zvi are also available in his book, “The Best of Zvi,” available at our online store. The Friends of Israel Today and Apples of Gold theme music was composed and performed by Jeremy Strong.